Discovering damage on your property can be frustrating. The vulnerability people feel when they discover damage from trespassers is real – whether they be animal or human. The right approach to dealing with it depends a lot on who or what the trespassers are. Animals can be a nuisance. People can be a threat. The perpetrator’s identity dictates the appropriate course of action. More and more, property owners are turning to trail cameras to help them identify offending critters or vandals. A motion detection camera is often the simplest solution to a host of security problems. It can get you undeniable proof of what is happening on your property – day or night – so you can sleep in peace. A trail camera is a motion activated camera housed in tough, waterproof cases. Like a digital SLR camera, most of these critter cams store pictures on SD cards. Users then retrieve the SD card later to see what’s been happening on their property. Most trail cameras even stamp the photos with useful information such as date and time. Some people respond to acts of vandalism or animal damage by installing a security system, which is a permanent but expensive solution. Depending on the location of the property, a full security system may not be feasible. What these people really need is a critter camera. Unlike surveillance systems, trail cameras are not always recording. They work on an outdoor motion sensor. Essentially a critter camera, they record only when they detect motion.Once triggered, they begin shooting pictures or recording video. They then go back to being a sentinel until they detect more movement. Security systems also require electricity, so the property must be on the grid. Trail cameras typically use AA batteries, so their installation is as simple as possible. The decision to use a trail camera for security may be a matter of simplicity, but choosing which trail camera to use is a little more complicated. This type of trail camera uses a bright white light to illuminate the area being photographed. White-flash cameras produce clear color photos day or night. On the downside, the white light is easy to see, and animals are usually startled by it. While it may serve as a deterrence temporarily, they soon acclimate to it and return. The problem is worse where unwanted human guests are concerned. People easily see the light and know where it came from. They then have incentive to turn their activity toward eliminating the trail camera. Hopefully the camera will be mounted in a way that makes it difficult to access, but it is always better if it doesn’t attract attention. Also known as red-glow cameras, a low-glow trail camera uses infrared light for night photos. The infrared light is nearly invisible to most creatures, including humans. People are not likely to notice the infrared light illuminate the vicinity, but these cameras still announce their presence. The problem with using low-glow trail cameras for security purposes is the tendency of their LED emitters to produce a soft red glow. The light is faint and is typically only visible on the camera itself. Objects will not usually appear illuminated to the subject in the frame, but the glow is noticeable and may attract the attention of humans, who will then realize they have been photographed. If you read a lot of critter camera reviews, you’ve heard of this one. Just like red-glow cameras, no-glow cameras emit infrared light when taking pictures at night. What makes these cameras different is that they use “black” LED lights, which are invisible when the camera is working. The telltale glow that gives away the position of red-glow cameras is missing, so no one is the wiser that photos or videos are being taken. Without the red glow, neither animals nor humans will have any indication that they are on camera. They won’t adjust their behavior and can be captured in the act – criminal or otherwise. Human subjects also will have no cause to suspect they’ve been incriminated, so the trail camera will be safe from damage or theft. Animal intruders won’t get skittish. There are a few different variations of these technologically advanced trail cameras, but the basic function is mostly the same across the market. 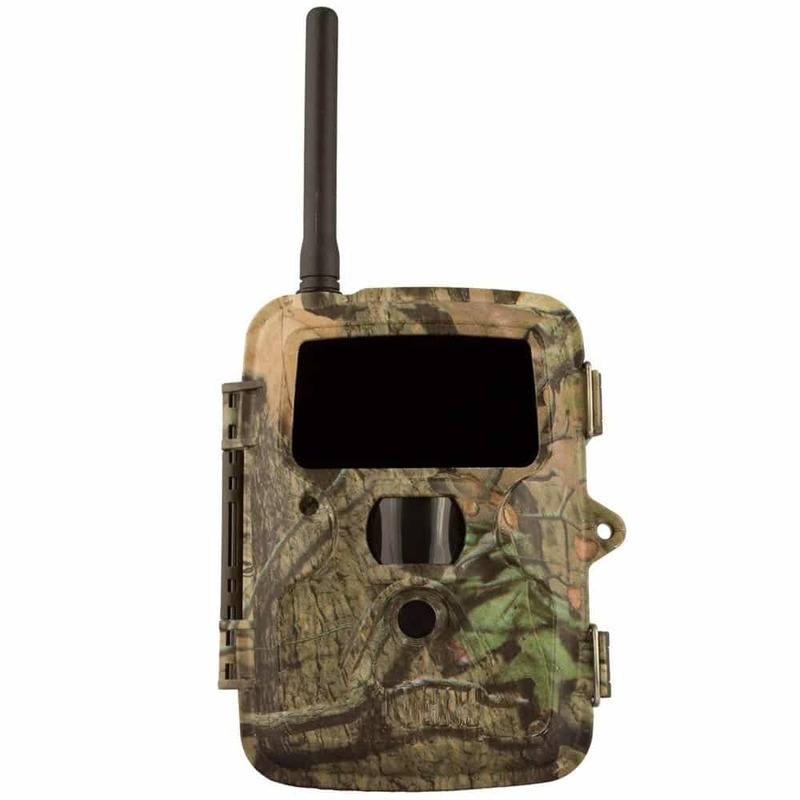 Cellular trail cameras usually work just like any other trail camera, except they offer the ability to send the pictures they take directly to your cell phone. Your camera then effectively becomes a security alarm, silently notifying you of motion detected on your property and beaming you an image of the perpetrator. Of course, these functions come with limitations, some of which are the same ones that affect cell phones in general. The quality of the cell service in the area will make or break these trail cameras as an option. Unreliable service might make camera triggers go unnoticed, though they will still be recorded by the onboard SD card. False triggers might also have your trail camera sending pictures of nothing to your phone. False triggers are a problem for even the best trail camera. These annoying glitches occur when some random object – a branch blowing in the wind perhaps – sets off the trail camera’s detection circuit. The resulting picture will be empty of anything interesting. False triggers can cause a lot of wasted time sifting through pictures. They also waste SD-card space and battery power. Let’s look at a few tips for setting up your trail camera to help eliminate false triggers and to keep your camera safe from theft. This step prevents outright theft, but it also helps catch a culprit in the act. Using a camera with a camouflage case in a discrete location can make it hard for trespassers to spot your trail camera before they can trigger it. When they don’t know they’re being filmed, animals and people go about their normal activities. Place the camera in a location where a thief would need a ladder to reach. How can you be sure it’s high enough? If you need a ladder to install it, a vandal will need one to reach it. It isn’t about making it impossible to steal the trail camera. The point is only to make it difficult, which is usually deterrent enough. There is a cone of passive infrared (PIR) that extends out from the trail camera. The motion of animals or humans passing through the PIR – or the difference between their body heat and the surrounding air temperature – is what triggers the camera to take a picture. Action that happens outside of this cone will not be recorded. The detection zone may be wider or deeper for one camera than for another, which is why it is important to know this information for the model of trail camera you are using. A wide detection zone or one that reaches out particularly far (some models can extend past 100 feet from the camera) are perfect for surveying large areas like back yards. A more narrow detection zone may work better in an alley way or high-traffic area. False triggers can drive a trail camera owner crazy, but they are often the result of one or two common mounting mistakes. First, avoid pointing the camera in a direction where it will face direct sunlight, the heat from which can play tricks with the camera’s PIR detection. Secondarily, the light from direct sunlight can wash out photos. Try not to set up the camera so that it faces east or west; try to face it north or south instead. Another tip is to mount the camera on a solid, sturdy object. There is nothing wrong with mounting the trail camera on a tree, just be sure the tree is strong enough to not sway in the wind. If a trail camera is allowed to sway, it will trigger repeatedly as everything in frame appears to be in motion. Once you have selected a location for your trail camera, take some time to secure it properly. Most trail cameras offer several options for attachment. Most have loops for straps or connections for theft-prevention cable locks. Again, it isn’t as important how you mount your trail camera as it is that it have some form of theft deterrent. The means you choose to secure your trail camera do not need to be bulletproof to be effective. It is okay if thieves would be able to remove it with tools, but they should at least need tools. The most important thing is that you force them to take time to do it, and time is not something trespassers usually like to take – especially if they know they’ve been recorded. If you’re having trouble with animals or people damaging your property, the first step to standing up is to identify the culprit. Dealing with the perpetrators may be best left up to the proper authorities, but their detection and identification are in your hands. An outdoor motion activated camera can get you the proof you need while you and your gear remain safely undetected. Why is My Trail Camera Not Taking Pictures?